Have been using Ashampoo B S for sometime now and found it a very reliable program and one I've come to like. Lately I've begun to have a problem with it and Ashampoo themselves are very slow to respond to requests for help. programs appear to be working. I've uninstalled and reinstalled the program but that didn't help either. Am at a loss!! This is a tough one, really difficult to diagnose without any hands on. You've already tried what most would advise, i.e. uninstall and re-install, but that hasn't worked so it's difficult to know where to go next. It certainly sounds symptomatic of a corrupt installation. 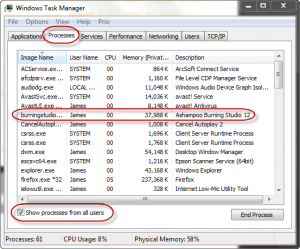 When you run the program, even though it appears nothing is happening, is there any entry for "burningstudio" under Processes in Task Manager (see screenshot)? Hope you had that well earned rest!! for a few seconds and then disappears. Don't know what that means!! Okay, thanks. It means the program is executing okay but for some reason is almost immediately closing down. Sounds like maybe a link to an associated executable or DLL, or some other dependency is missing or corrupt. 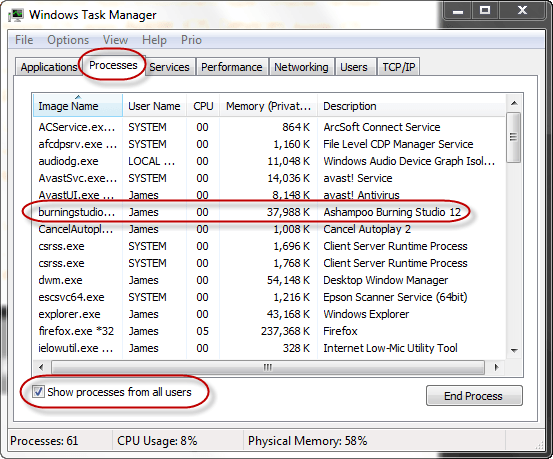 Open the Ashampoo Burning Studio folder and look for "burningstudio14.exe", then double click on that executable. Unfortunately, my contact at Ashampoo is with the PR team and not part of support. However, if you cannot get any satisfaction through Ashampoo Support, get back to me and I'll see what I can do. Thanks for reply. Yes I've tried running the program from within the program but makes no difference. I've been in touch with Ashampoo but as I said before they are not very helpful. Several times they've just said there is a program on my system blocking BS14 from starting and there's not much they can do until I find out which program it is. They sent me a debugger but when I try to use it windows blocks it as an unsafe program even though I have turned off security and antivirus etc on my machine. This is the first program that has given me such a great amount of bother. I don't know whether this helps or not. Okay Gerald, let's take a look at programs you have installed after BS14. If you go to Control Panel>Programs and Features and click on the on the "Installed On" column header, it will sort the list by installation dates in chronological order. See what programs you have installed AFTER BS14. Especially around the time this issue first appeared. Also; can you please provide a list of ALL security software you have running. Thanks for reply. Since my last post I received an email from Ashampoo. run it and then trying restarting BS14 and then send in the report file. the whole machine. It has been churning out a report from 3.00p.m. PS Followed your instructions and BS14 was the last program installed. I have AVG, Malwarebytes and Windows firewall on my machine. Ashampoo didn't send any instructions?? Unbelievable!! I am far from expert in debugging but you should only need to run DebugView while replicating the problem and that should be it. Sorry for not getting back to you. Still not able to run the program. problem. Thanks for your help so far and trust you are keeping well. a successful sign-in by Microsoft. Any ideas what the problem might be? Unfortunately Gerald, it sounds as though your Hotmail account may have been hacked. If your machine is infected, this may also be associated with your BS14 issue. I suggest you scan the machine asap using Malwarebytes Anti-Malware. I see you already have Malwarebytes installed on your machine. Make sure the definitions are up-to-date and then run a FULL scan. Thanks for reply. I ran Malwarebytes as you suggested but everything seems to be in order. Ashampoo is working in fits and starts now and not every time I try to access it. With regards to email (Hotmail) I have got it up and running but I can't send emails although I can receive them OK. The error message that comes back says that password/username not accepted and yet when I go back through the settings - password and username - everything seems to be in order. Now I'm kinda stumped as they say.